The study showed in Los Angeles that white and Asian teachers were overrepresented and that the number of black teachers was in parity to the percentage of black students. The district showed a slight increase in Asian teachers between 2002 and 2011 and “meaningfully large increase” in the percentage of Hispanic teachers (about 7 percent). Even so, the gap between Hispanic teachers and percentage of students still remained large despite the increase in Hispanic teachers. Although white teachers still are a large percent of the teaching population, the decline in white teachers was steeper in LA Unified than any other race. The study focused on racial mixes to show if there’s a “representation gap” between the percentage of minority students compared to the ethnic mix of their teachers. 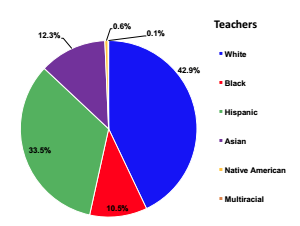 The study also found that a severe lack of black and Asian male teachers at LAUSD means “that black and Asian boys were particularly affected by disparities in characteristics between teachers and students.” The number of male Hispanic teachers was actually slightly larger than that of black and Asian teachers of either gender. New hires of black and Hispanic teachers increased starting in 2009, and the study pointed out that hiring rates for that period were quite low. Attrition rates were higher for white, black and Asian teachers, with about four out of 10 leaving the profession after three years, while for the Hispanic teachers three out of 10 left the profession after the same period. And, perhaps not surprising, the study showed that the typical Los Angeles teacher, regardless of ethnicity, worked in a school with a high percentage of lower-income students (75 to 85 percent) and minority students (90 to 96 percent).